50% OFF SATURDAY! EVERYTHING MUST BE SOLD. 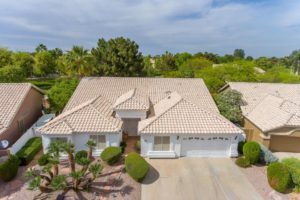 This is a fabulous estate located in Fountain Hills. To start there are many magnificent solid Rosewood furniture pieces including a hand carved buffet table, bar, end tables, accent tables and many more. There are also two extraordinary hand carved Rosewood chairs with Celadon accent in the back. Between these chairs is a matching Rosewood table with a Celadon top– these pieces are gorgeous! On the floor are many hand knit wool rugs in many colors and styles from blue to brown to green. 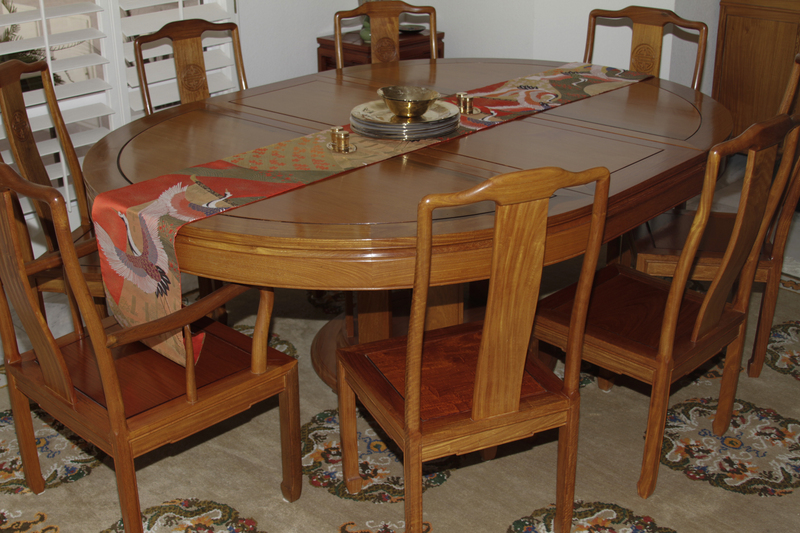 In the dining room you will find a solid Rosewood dining table with twelve hand carved Rosewood chairs. All have nice cushions, but they were removed to display the beauty of the carved wood. Sitting on top are solid brass chargers, bowls, plates and salt and pepper shakers, sitting on an Asian table runner. There is even a wonderful hand carved Rosewood china cabinet and a Rosewood display cabinet and two Rosewood corner display cabinets. Again, there are many accent pieces from a solid Rosewood plant stand to a bar cart to nesting tables. Beneath the dining table is another hand knit wool rug that is truly one of a kind with green and gold tones. On display there are many smaller items including a hand painted cloisonné table lamp and large cloisonné eggs. There are also many framed Asian silk screen wall art and beautiful hand painted tiles. In the display cabinet is a collection of birds from around the world including glass and porcelain. On the mantle there are some incredible hand painted signed Korean vases. Surrounding these are two intricate hand painted Familial vases, two Inuit Eskimo carved stone sculptures. On the walls there are many paintings, lithographs and silkscreens from around the world. You will even find a large Navajo signed pot. On display throughout the house are some great faux plants in a variety of large pots from Asian to hand crafted artisan clay pots. There are also numerous Celadon glazed vases, jars, plates and even a salt box. Also, in the display cabinets are numerous other finds from a Limoge trinket box to several magnificent multicolored vases on wood bases. There is also a jade alligator and there are two hand carved wooden Buddha sculptures, a framed silk screen Buddha pictures and a framed picture of Buddha. You will also find a lot of other pieces from Sheffield tea pots to beautiful silver-plated baskets and vases. There are also many cobalt blue Asian porcelain figures, lamps, vases and many others. As you continue through the house you will find an office with a stunning hand carved Rosewood bar and three Rosewood book cases loaded with books. There is a lot to see here including Rosewood accent tables, a pair of nice leather chairs with ottoman, and many smaller décor from Asian vases to a fun pair of cast iron crabs to various clay and porcelain pieces. You will also find metal Aborigine figures and a Navajo snake basket. There are also some nice table lamps including a gold trimmed porcelain lamp with a painted crane. A beautiful blue and cinnamon colored signed vase with lid sits on top of a Rosewood display stand and there are numerous trinket boxes, paintings and lithographs. Also, on the tables and shelves are many table books and non-fiction books from art to nature. As you venture into the back of the house you will see some incredible framed Batiks and a large vintage wood trunk. There are many solid brass pieces here as well, including a pair of solid brass clogs, a brass mortar and pestle, brass candlesticks and a nice brass pitcher with faux flowers. 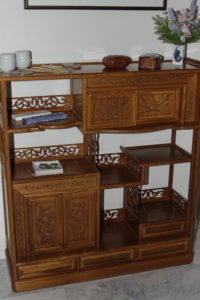 Again, there is another hand carved solid Rosewood Asian cabinet. You will also find another celadon table lamp and various other porcelain boxes, vases and a lot of wall art from a signed oil painting of fruit to signed and numbered lithographs such as “Midnight Express” #32/50. And hanging on another wall is a solid Teak hand carved African mask. Venture into the first bedroom and there are two nice Mid Mod chairs in blue cloth with wood legs-very nice! There is a gorgeous blue table lamp sitting on top of another solid Rosewood cabinet. Across from the chairs is a very solid handcrafted Rosewood desk. Here you will find a collection of hand carved and hand painted ducks, including a limited-edition Mallard, North American Wood Duck, Blue Winged Teal Duck, a pair of hand carved and painted Asian ducks, two vintage hand carved wood ducks, and many more. There are numerous decorative artisan and Asian pots with faux plants and a lot of nice framed artwork on the walls. The master bedroom consists of a nice Thomasville bedroom set and two beds with metal headboards. There are several accent chairs and a great matching bench. On the nightstands and dresser are various table lamps and many, many boxes from trinket boxes to hand painted Asian boxes and even a Tiffany glass trinket box. 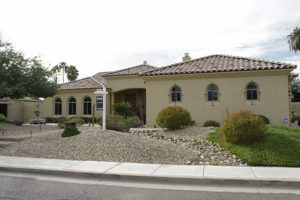 There are also numerous floor rugs and nice bedding and linens. On the walls there are some great prints, watercolors and lithographs, including a signed series of the four seasons. Many signed wall hangings can also be found hanging among the other artwork. There are also many floor vases and a whole lot more décor throughout. The closets are full of nice clothing, shoes, handbags and some very nice scarves. In the hallway you will find a different signed series of the four seasons, a solid Rosewood vanity and stool and numerous framed artwork. Continue to another bedroom and there is a solid Rosewood chest and nightstand and a small desk or vanity with a stool. There are two beds with metal headboards. Hanging above are two batiks. There are various animal figures in here from a metal elephant to hand carved wood giraffes to a pair of metal birds. There are a series of framed batiks on the walls and a pair of framed prints of Asian masks. The Trail of the Painted Ponies #5528 Black Horse also sits on the desk. You will also find porcelain Asian dolls and a few Asian umbrellas. There are also nice unique table lamps and various other finds. In the kitchen are many artisan pieces from Holland Boone Pewter plates, bowls and relish trays to many handcrafted bowls, cups and plates. There is a very nice set of blue frosted Asian glass plates. For those who like teapots, there are many from a cast iron teapot to a green ceramic tea pot to a ceramic and metal teapot and even a silver Cristal teapot and a teapot from Bauscher Weiden. You will also find hand painted mini teapots from Kelvin Chen. There are many items in the kitchen from an All Clad pan to a beautiful pewter Candelabra platter. You will find everything from a Henckels knife set to a Cuisinart Duet Blender and nearly everything in between. The kitchen is also not short of décor as there are various decorative plates and various art pieces on the walls and on the counters. There is also a nice glass top kitchen table and four Rattan chairs. On the patio there are two solid iron chairs with ottomans and a large circular tile top table. You will find an interesting green table with four stools and chimeneas on metal bases. There is a very nice red umbrella from California Umbrellas. The patio is not short of art pieces or décor. There is a large metal bench with decorative tiles and a metal table with decorative tiles on top. You will find a lot of pots, including wall pots. Three ceramic roosters sit a top the counter and there are also various other pieces including a pair of Foo Dogs and glass candles. From hand decorated tiles and wall art to artisan pots, plants and copper plates from various regions, there is a lot to find here. There is even a beautiful handcrafted wood bench with metal accents. 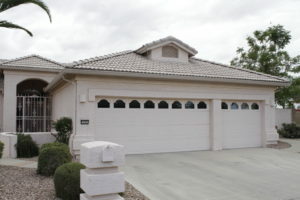 There is so much more here including a garage.